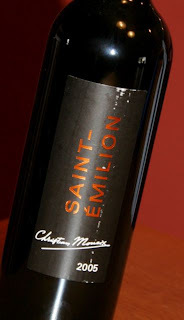 Popped open a bottle of the 2005 Christian Moueix Saint Émilion tonight. This one is made from 85% merlot and 15% cabernet franc. I liked it very much even if it was a little bit light. It had a nice medium purple red color that you could easily see through, so it was obvious this would not be a heavy wine. On the nose I was presented with subtle ripe cherries and aromas of sweet tart candy. Very interesting to say the least. 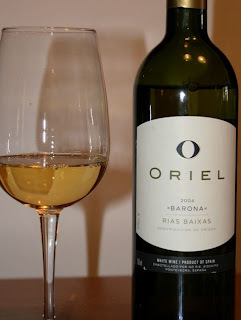 On the palate, however, there was nothing fruit or sweet about it. It was oh so vegetative. I enjoy that. 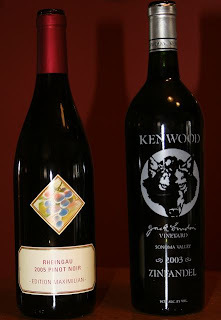 It had a medium body, solid acidity and smooth tannins. Red fruits came across so very subtly however it was the roasted beets, cooked carrots and tomato sauce that dominated the flavors. It was a little bit chalky and a tiny bit disjointed on the finish but overall it was a nice Bordeaux red. I bought it for $14 on sale which was an ok price. I don’t think I’d pay the $30 or so full price for it. The Pinotage grape has been grown in South Africa for almost 100 years. It is a hybrid of pinot noir and cinsault. I like the big fruit that comes from this grape but it can be somewhat finicky to grow. During fermentation it has been known to produce a significant amount of isoamyl acetate giving it a paint-like smell and taste. 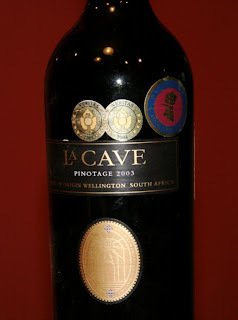 This evening I opened a bottle of La Cave 2003 pinotage produced by the Wamakersvallei winery in Wellington, South Africa. This is a deeply colored wine with an inky quality. The nose I would say is terrific with gobs of dark red and black fruits and hints of tropical bananas (as the label says). I pick up cocoa and leather as well on the nose. On the palate the fruit is big and heavy. The tannins are very solid yet not too overpowering. 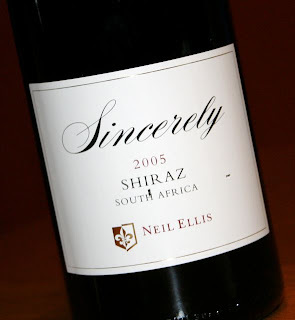 Cherries and blackberries mingle with oak and chocolate in the mid-palate. Unfortunately this wine has a rather unpleasant finish reminiscent of gasoline and plastic. I wonder if that is some of the isoamyl acetate coming through. You don’t notice it too much until the long lasting fruit wanes, but it leaves you with a chemical taste at the end that is hard to overcome. Because of that I have to score this wine lower. I would give it a 90 for the up front fruit and mid-palate but an 80 for what it does on the end.